Welcome to Part 3 of the free Autoimmune Disease 101 Series! If you missed Part 1 – What is Autoimmune Disease, and aren't familiar with what autoimmune disease is, how to treat it, and want some easy ways to start feeling better now, make sure you go back and watch that. And then in Part 2 – How diet and lifestyle affect autoimmune disease, I discussed how what you eat and how you live either keep your symptoms going or help you find relief. I also did a high-level overview of the diets I recommend. In this section, I discuss each of these diets in more detail. Before I get into the autoimmune diet options, let me state that I'm neither a medical professional nor a licensed dietician. So take what I say with that in mind. I'm a health coach and autoimmune disease sufferer who avidly researches all the options out there and have come up with my recommendations based on my training, research, and talking to hundreds of other autoimmune disease sufferers who have started to feel much better using these methods. The gluten-free diet is the least complicated and least restricted of the diets I recommend, but also the least effective. As in, if you eat a gluten-free diet you may still not feel your best. Some people can eat a gluten-free diet and all of their symptoms disappear, but for many, it does require a bit more. Gluten is a protein found in wheat, barley, rye, and triticale which has many mechanisms by which it gets into our guts and immune systems (not good). Everyone, even healthy people, experience the same effects, but for those of us with autoimmune disease and/or some type of gluten-sensitivity, this can have lasting ramifications. Items like corn, dairy, and oats also look very similar to gluten to our bodies, so if you don't feel better on a gluten-free diet, these might be the next line of items to remove. I recommend going gluten-free for at least 3 months, as that's how long it takes for our bodies to stop reacting and to calm down from the inflammation caused by consuming gluten. You also must not cheat. Even one crumb of gluten, whether you are Celiac or not, can cause weeks of damage. The Paleo diet is the next diet I recommend, and the one I use for my long-term “home base”. (I mean, kind of obvs as my blog is called Thriving on PALEO). This diet is more restrictive than gluten-free, but also more effective, for quelling inflammation throughout the body and has helped countless people feel better. It's starting to be recognized by the medical community as a good option for a number of ailments. Paleo removes: grains, gluten, legumes, beans, dairy, processed sugars, processed oils, and food chemicals. Read this if you're wondering why we give up grains on Paleo. That it's all meat, all the time – and while you could make it that, you probably shouldn't. Meat does provide a lot of the vitamins and minerals your immune system needs to function properly, but it's very important to eat a wide variety of vegetables as well. Instead of those sensationalized photos of a large steak on someone's Paleo plate, your plate should instead look like a huge portion of vegetables with a 4-6 oz piece of meat. That it's a low-carb diet – sure, it's much lower carb than a Standard American Diet where people are eating cereal for breakfast, a muffin for snack, pasta for lunch, a pastry for snack, and pizza and beer for dinner, but it's not “Low-carb”. You can eat a low-carb version of Paleo (and many people who follow the Keto diet do), but for many, if not most on the Paleo diet, eating things like sweet potatoes, squash, fruits, maple syrup, honey, and vegetables are everyday occurrences. I like to call it a “moderate carb” diet. The Paleo diet is great for those who do suffer from the cross-reactivity I mention above in the gluten-free diet section, as it removes most of the gluten cross-reactive foods. There is a lifestyle component to the Paleo diet as well, which aims to reduce stress, get adequate sleep, and exercise in each day. 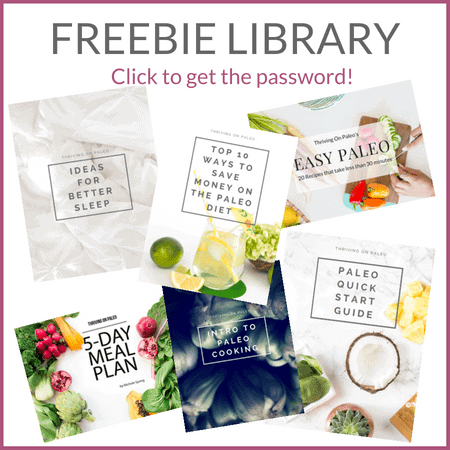 If you're interested in learning more about this diet, get the Paleo Starter Guide in my Paleo Freebie Library). The Whole30 is a diet by Melissa and Dallas Hartwig that is based on the Paleo diet, yet also removes ALL sugars (even honey and maple syrup) and treats and treat-like foods. So there are no Whole30 waffles, muffins, pizza, tortillas, etc and you also cannot have store-bought chips or anything that could be considered “food without brakes” – food where you might eat a ton in one sitting without even really thinking about it. This is a 30-day effort, which is quite popular with lots of people around January after the holidays. It's a great intro to Paleo and also a good way to “clean up” your diet if it's slipped into a place where you just don't feel your best anymore. I personally use it to help quell any Hashimoto's flares I get if I've started to eat too many Paleo waffles and cookies (many of my flares seem to be blood sugar-related). It's very effective for balancing blood sugar and hormones and teaching you what hungry actually feel like again. Not in a bad, “I'm hungry all the time way”, but in an “oh, THAT'S what that grumble in my belly is” rather than “I'm extremely irritable and shaking – I need food NOW” kind of way. I find a lot of people with an autoimmune disease – well most people in general – could work on getting off the blood sugar rollercoaster, and when you balance your hormones you'd be amazed at how much better everything feels. Many who do Whole30 move onto a Paleo diet afterward. I am working on a Whole30 Starter Guide, but it's not done yet. Until then, the Whole30 site is the best place to get accurate info (there is SOOO much misinformation out there. I mean, google Whole30 Waffle just to find out what I'm talking about. There is no such thing as a Whole30 waffle). Also, I recently completed a Whole30 to try to help with a massive Hashimoto's flare I was having, so if you want to see the kinds of meals I ate, how I prepped, what I ate on vacation, etc, check out my Whole30 Series. The Autoimmune Paleo Protocol (AIP diet) is definitely the most restrictive one of all of these diets – but the most effective at helping with autoimmune disease. This diet isn't something to be entered lightly as it takes a commitment and you shouldn't cheat at all as that can ruin your results and hard work. Yet, if your quality of life is suffering as a result of your disease, it's definitely worth trying. This is the diet that's gotten me back on my feet several times. Once you start feeling better on the elimination diet you start adding foods back during the reintroduction phase. You add the foods back one-at-a-time according to specific stages and wait at least 72 hours in-between foods to see if you have any sort of negative reaction. No reaction means the food can be added back into your diet. A reaction means you need more healing and shouldn't add that food back in – yet. The foods removed are based on scientific research done by Dr. Sarah Ballantyne which indicate adverse effects for those with autoimmune disease. These effects include causing a leaky gut, preventing a leaky gut from healing, inflammation, and immune system stimulation. IF you've done AIP and still aren't feeling better after 90 days, it's important to work with a doctor to find out if you have some underlying condition that may be preventing you from feeling your best. This could range anywhere from parasites (quite common) to infections (also very common) to vitamin and mineral imbalances that you aren't addressing. And remember – it's CRITICALLY important that you don't stop any medications unless your doctor tells you to. Medications with autoimmune disease can help in many ways, and sometimes it can be life-threatening if stopped. join my AIP-only membership site – The Autoimmune Collective. It's got an entire A-Z “How to Do AIP” Course, plus batch cooking plans, meal plans, freezer cooking plans, recipes galore, and a community of others doing AIP as well! Make sure to sign up for my newsletter which gives tips, inspiration, recipes, and anything interesting I've learned about autoimmune disease, the Paleo diet, AIP diet, etc. I wish you the best of luck in your autoimmune journey!